The Manu Smriti or “Laws of Manu” is a very ancient text which has formed the source for Hindu Law and Social customs for thousands of years. Hinduism in contrast to the Abrahamic religions does not have a sacred code of laws dictated verbatim by God. All existent codes of law are based upon time, place and circumstances of the people and communities to whom they apply. The “sacred” laws of the Hindus are the judgements and teachings of sages who were inspired by the values and mores found within the corpus of the Veda. The Veda is comprised of hymns, and poems of inspired and enlightened Rishis. There is no systematic philosophy, theology or Laws in the Veda —all of these categories of knowledge must be constituted on the basis of ideas within the hymns and poems. The most famous digests of Law apart from the Manu Smriti are the Laws of Yajñavalkya, Apastamba and Parashara to name just a few. Many of the law givers disagreed on numerous points of law and custom and consensus was hard to obtain. The Laws of Manu are very comprehensive ranging from the Duties of Kings to domestic management. Much of what he taught as Law is no longer applicable, dealing as it does with the duties of the various castes and customs, and social situations and conditions which have now become irrelevant and obsolete. The purpose of this publication is to resuscitate this body of ancient teachings and to nurture those that are still relevant to the modern world. Short characteristic of the work The Laws of Manu, contents of chapters and autorship. The Source of this work and an account of the origin of the Universe; with a summary of the contents of the whole Book. Sources of this System and the Countries where it obtains; on the first condition of Life of a Brahman, or that of a Student. On Marriage and on the Religious Duties of a Householder, or the Second Stage of Life. A Householder’s Duty as regards Subsistence and Private Morals. On lawful and forbidden Food, Impurity, Purification, and the Duties of Women. On the Third and Fourth Stages of Life, or the Hermit in the Forest and the Ascetic. On the Duties of Kings and the Second Caste. Duties of Husband and Wife, Laws of Inheritance, Duties of a King. The Mixed Castes and Classes: Procedure in time of Need. Transmigration, Supreme Bliss, and Doubtful Points of Law. . 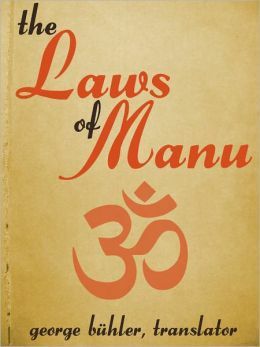 The Laws of Manu is not only the most important of all the legal codes, but it is regarded as almost equal in holiness to the Vedas. Every Brahman is enjoined to read it, at least once in his lifetime. A Brahman family in which Manu has not been read for seven generations ceases to be Brahmans. Its opening verse narrates how the great sages approached Manu, the descendant of self- existent Brahman, and asked him to explain the sacred law. Manu agrees to their request, and gives to them an account of the Creation as well as of his own origin from Brahman. After mentioning that he learnt ‘these Institutes of the Sacred Law’ from the Creator who himself produced them, and that he taught them to the ten sages whom he created in the beginning, he transfers the work of expounding them to Bhrigu, one of his mind-born sons. First he gives the theory of the seven Manvantaras, the Yugas, and other divisions of time, as well as an incidental description of the order of the Creation. and winds up with an enumeration of the contents of all the 12 chapters of the work, which he promises to expound ‘exactly as it was revealed to him’. Hindu writers often attributed their compositions to mythical personages, to give an air of antiquity, and divine authority to their works. Real Origin of the Manu Smriti. It is quite certain that the text is sometimes called Mānava Dharma Shastra and originates not from a mythical Manu, as stated in the first chapter, but that it is so called from the Mānavas, a Brahman Gotra, and division of the followers of the Black Yajur Veda. The Mānava Dharma Śāstra may be considered as a recast and versification of the Dharma Sūtra of the Mānava Sūtrakaraṇa, a sub-division of the Maitrāyaṇīya school, which adheres to the Black Yajur-Veda. who probably lived in the North-western region between the rivers Sarasvatī and Drisadvatī, not far from Delhi and the scene of the great social conflict described in the Mahābhārata. This tribe seems to have belonged to the Taittirīyas, ‘adherents of the Black Yajur Veda;’ and their Mantras, Brāhmaṇa, and Śrauta Sutras are still extant, but their Grihya and Sāmayāchārika Sūtras appear to have perished. In all probability, too, many of the rules, as we have them presented to us, were simply theoretical,—inserted to complete an ideal of what ought to constitute a perfect system of religious, criminal, moral, political, and social duties. Who the real compiler and promulgator of the Institute was, is not known. He was probably a learned Brahman of the Mānava school. As in many other cases, authorities are not agreed on this point. It is allowed by all that a number of verses of an early date are included, but when the work assumed its present form is doubtful. The Laws of many cannot reasonably be placed later than the 5th century B.C. The gods mentioned are chiefly Vedic, and the fourfold caste system is that of the Purusha Sūkta. There is no direct allusion to Buddhism, though many of Manu's precepts are decidedly Buddhist-style, having frequent parallels in the Dhammapada, which indicate that Buddhist ideas were gaining ground in the locality represented by the Code. The whole of the first chapter must be considered as a later addition. No Dharma Sutra begins with a description of its own origin, much less with an account of the creation. The first chapter of Many Smriti, which would be absurd in a Dharma Sūtra, has been added in order to give authority to a remodelled version. The last 12th chapter has been dragged in, because the myths connected with Manu presented a good opportunity to show the greatness of the scope of the work. The classification of actions and existences as Sāttvika, Rājasa, and Tāmasa, i.e., as modified by the three qualities of Goodness, Activity and Darkness, finds no place in the older law books. The introduction to Nārada states that the work of Manu originally consisted of 1000 chapters and 100,000 ślokas. Nārada abridged it to 12,000 ślokas, and Sumati again reduced it to 4,000. The treatise which we possess must be a third abridgment, as it only extends to 2,6854. We are told, Manu I. 103, that “a learned Brahman must carefully study these (Institutes) and must duly instruct his pupils in them,” but that “nobody else (shall do it).” Brahmans are to teach the Śāstra and all Āryans may learn it. It nowhere teaches the performance of other rites than those prescribed in the Vedic writings, and it nowhere inculcate the exclusive worship of one of the deities of the Purāṇic sects as we find it recommended, for instance, in the Vishnu-Smriti. If viewed rightly, this book presents a very logical arrangement. 2. Proper conduct for every Varṇa. Propriety of conduct for a person was supposed to be determined by his origin. Every creature was supposed to be endowed with some peculiar nature at the time of creation, and consequently the writer first deals with the creation at the very beginning of the book. That in introducing the account of creation at the beginning the author was influenced by the Purāṇas, which were becoming popular at this time, is a fact too plain to need further comment. Then He turns to duties of the four orders (āśrama). The dharma for the four orders (āśramas) is treated along with the duties for Brāhmaṇas, as the former was likely to be followed by Brāhmaṇas only, though it was desirable for all other Varṇas to do the same. This treatment takes up chapters 7 and 8 and most of chapter 9. He explains the dharma for Vaiṣya and Śūdra in the few concluding verses of chapter 9. It was a period when a dharma-writer could plainly see that it was not enough to explain dharma for four Varṇas. There were mixed castes to be guided. He had also realized that none of the four Varṇas could observe their respective dharmas in the times of distress. He again knew that people may happen to break the injunctions of dharma, and this problem also demanded treatment. For this reason, the writer takes up these three questions; and in the treatment of the last question he includes the theory and practice of penances, which brings us to the close of chapter 11. All this was to be done to reach the supreme bliss. For the proper comprehension of the rules governing the supreme bliss, he discusses the law of the transmigration of souls. After this is done, he treats doubtful points of dharma and then concludes the 12th or last chapter of his work.